It’s probably more like day 250, since I’ve been sorting, discarding and packing since last July. This feels like Day #1. Today my money is on the way to getting me the new apartment. Yesterday the closing company sent the settlement statement form with the accounting of taxes, fees, partial months, and all the money I owe. I arranged for the money to be wired to the closing company. Later in the day they sent a revised form showing I owed even more money. Fortunately, I didn’t do the transfer until this morning. This evening I received another revised statement. I guess they’ll have to take cash. What a business. Also, yesterday I finally heard from the contractor I brought to the apartment last month to give me prices on things I would like to change. That visit was like a circus. I came with my realtor and the contractor to find the seller, his wife and his realtor waiting for us. Seller and wife live in a different apartment in the building. They were very pleasant and gave me all sorts of info about the apartment and the building. Unfortunately it made it very difficult for me to work with the contractor. I told him roughly what I wanted and left him to measure and figure. After we close on Friday I’ll go to the apartment and mull over the changes I asked for, and some I didn’t mention. In the hallway a false ceiling like a trellis hides two 72″ florescent tubes. The light is garish even to me who likes lots of light. I won’t mention the trellis. As soon as I walked in seller and wife told me they loved the trellis. I couldn’t bring myself to tell the contractor we were going to remove it. False ceiling goes, along with florescents, and wallpaper. I will hang pictures in the hall lit with track lighting. I woke up about 3am Sunday to find unusual light coming in the windows. Looking out I saw the backyard filled with dark, velvety shadows and silverly light in the center–moonlight. There is so much artificial light in my life I seldom notice moonlight. I like to look at the moon, but moonlight is not usually part of my life. I thought about it all day Sunday and resolved to wake up at 3am again and try to get a photograph. Waking up was the easy part. It’s very difficult to photograph what you can’t see. I shot four pictures, using different settings each time, and no ability to frame the pictures. 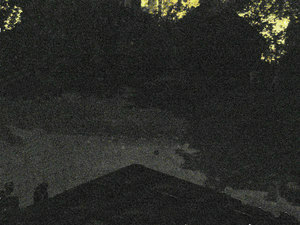 They all looked black at first sight, but thanks to the magic of Photoshop, I was able to capture my backyard in moonlight.